Roberto, the owner of Playground Rockstars near Tecumseh, MI contacted us a couple weeks ago about making a website for him and his business. Roberto already had a Facebook page for his business, but many of his customers were also asking if he had a website as well. Roberto had thought about getting a website but didn’t want to try and create one himself. The estimates he also received from other design companies were over $1,000 for a website design. After speaking with Roberto over the phone and answering his questions, he wanted to get started right away because of our low-cost website design services. Roberto asked us to download all of his Facebook pictures and post them to his picture gallery on the website – which we did. We also set up the information he requested for his home page and made a contact page for him. Within just a few days, his website was done and functional! We just spoke with Roberto a few days ago and he is very pleased with his website and said he has already made a couple more sales – simply because he had a website because it exudes professionalism. Thank you to Playground Rockstars and Roberto for being able to create an affordable website design for you! 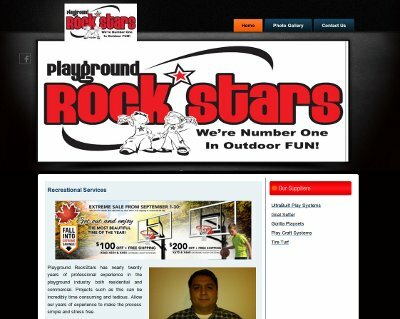 The Playground Rockstars website is at playgroundrockstars.com.